Greetings from the the Digital Learning Commons at the Middlebury Institute of International Studies in Monterey, California! We are looking forward to collaborating on the community initiated conversation, “Envisioning Distance Collaboration,” on Friday, November 11th . In the lead up to this conversation I’m sharing some reflections on collaboration and distance. In lieu of technical advice and fair warnings, I offer a verse, a tweet, and an invitation. I come to these words as a long time parent and more recently as a board member with the school. It is a board practice to begin our monthly face-to-face business meetings by reciting the ‘healthy social life’ verse aloud together. As we put voice to the words we glance around the room to make eye contact with each of the other members. To an observer or visiting member of the public this recitation might seem unusual, even a little strange, as a lead in to the formality of the business meeting agenda, but I have grown to appreciate the intention setting purpose of ‘the healthy social life’ verse. It is for me a simple but important performative act which focuses our attention to mindfully acknowledge each others’ presence, evoke a sense of community, and remind ourselves of the partnerships we have established with one another, the school, and the greater public we serve. The verse is grounding and clarifying. Everyone is present. Since these summer conversations with VC, the ACTT has continued to openly discuss our weekly meeting practices. We’ve also set aside some time for a conversation about the values that we bring to the work of the team. 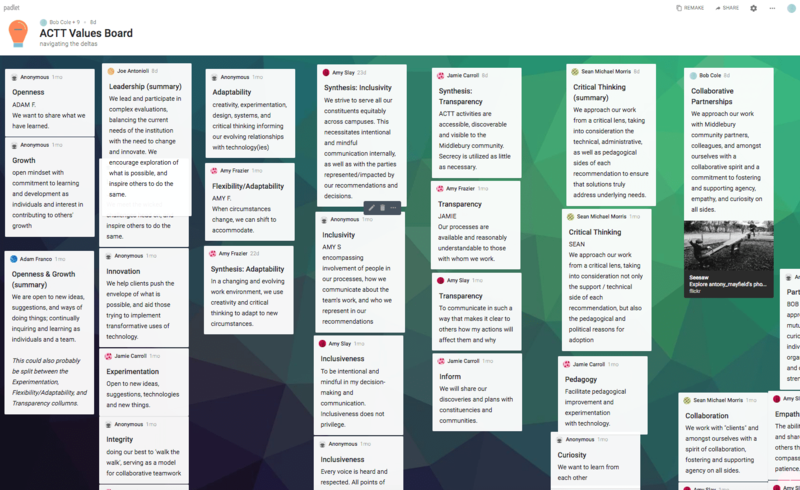 Here’s a screenshot from a digital post-it note board created on padlet where we’ve been synthesizing our thinking. Our draft of team values includes: openness, leadership, adaptability, inclusivity, transparency, critical thinking, and partnership. What’s rewarding about this work is that the distance in our work together has become a source for creative problem solving rather than an obstacle. We’re exploring how these values translate into practice. We’ve begun by adapting our meetings from a hybrid of face-to-face gatherings of College team members meeting in a room joined by remote team members via video conference to our current de-centered approach where all team members, regardless of location, join a virtual meeting via available web conferencing tools like Google Hangouts or Zoom. The shift has made a noticeable difference. Where before it was challenging and admittedly frustrating for those of us joining remotely to see expressions on faces, identify voices, or to participate in the fluid discussions of those meeting face-to-face, now, with a commitment to all-digital meetings, each member has an equal digital presence. I invite you and your teams to take notice of how and where you collaborate. If there is a distance involved that prevents meeting face-to-face, take some time in your next meeting to reflect on how it’s working for everyone. Ask those team members who are “away” to describe where they are, what the weather is like, what they see (and cannot see), what they hear (or cannot hear), where the pain points are with technologies or meeting spaces. By checking in from time to time, you may begin to uncover team assumptions and think creatively about how distance might inspire new opportunities to experiment, connect and collaborate. This post originally appeared on the Digital Learning Commons blog. Photo by Pascal, public domain. Great post, thanks. I have also found synergies between my work with Virtually Connecting team and my own virtual team environment. What this post has made me think about is the team dynamics in the location where the majority of the team are. When they get into a room to connect with other (singular locations) they fall into a pattern of behaviour like, 2 people do the most talking, 1 person rarely says anything, 1 person does a huge amount of doodling on their notepad and 1 person always, I mean always, sits off-camera. I wonder if this would change if they all sat at their desk in a ‘level’ meeting field? Thanks Wendy. The behavior you describe sounds familiar. The shift to everyone joining from their own webcam or in pairs has really changed how we interact and relate to one another. Wouldn’t it be strange to talk to someone in a face to face setting where you could only see an arm or only when they leaned forward to look around the edge of a door frame? A colleague here in Monterey shared a screenshot from a monthly meeting she participated in where a group of six or so people join a video call in a room where the camera is in a corner. This results in remote team members having to look at the backs of people’s heads. Again, when would this be a thing in a face to face situation? Video calls aren’t ideal either way, and some may balk at ditching the face to face. A little experience being on the remote side of such calls could go a long way towards building a case for experimenting with all-digital options!